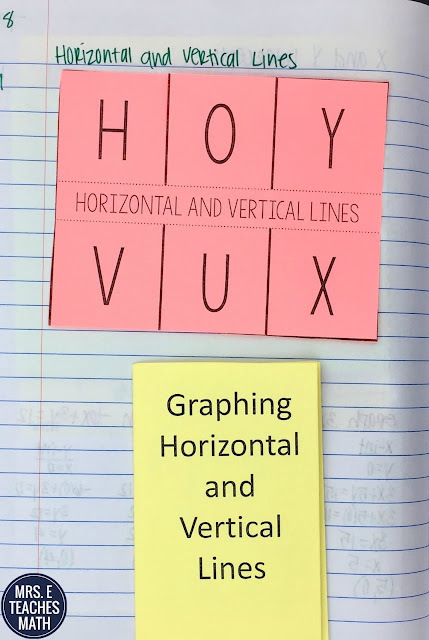 In the past, I’ve always noticed that my Geometry and Algebra 2 students have HUGELY struggled with graphing horizontal and vertical lines. I was determined to nail it in Algebra 1 this year, so that it wouldn’t be a problem for them in the future. First, I put the graphs of several horizontal lines on the board. I asked them “What would slope dude say?” He would say “This is zero fun”, so I had my students write the equations of the lines in slope intercept form using zero slope. This was pretty easy for them to grasp and they saw the patten quickly. Then, I put the graphs of some vertical lines on the board. They were totally stumped. They knew the slope was undefined, but they had no idea how to write that in an equation. I drew several points on one line and asked them, “What does x equal here?” “What about here?” “What about here?” Then, I wrote the equation of that one line. After that, they quickly were able to write the equations of the rest of the lines. After all of that discussion, I finally had my students take out their notebooks to take their notes. I taught them the HOY VUX acronym and gave them the pink flap book. Under each flap, they wrote what the letter stood for. Then, we folded a mini-book by Sarah from Math = Love (this whole lesson was heavily influenced by her). Each page of the book has students graph a horizontal or vertical line. Yes, it totally drives me nuts that I glued the flapbook in crooked. I was in a hurry! This lesson was short, and seemed simple when you look at their notebook. However, they remember it! We are finishing systems of equations now, and my students have not been struggling with horizontal and vertical lines at all. This lesson is definitely a keeper.